The Spirit Tree is grounded at the base. The trunk of the Spirit Tree grows in a manner and shape that gravity allows. The color of the trunk is determined by the mineral nutrients at the base. The leaves are forced from the branches and rely on the warmth of the sunlight to open. Our glass Spirit Tree Witch Balls are made from recycled glass in the Carpathian Mountains; the land of superstition, old world mystery and storybook folklore. As the ball is molten hot, the glass is formed, the ball is rolled into German made colored glass granules to provide the design. With this process each of our Spirit Balls are uniquely handcrafted and no two are exactly the same. Let the magic of our Spirit Balls protect and bring fortune your home. The size is 6" Diameter. Your tree will be absolutely unique! 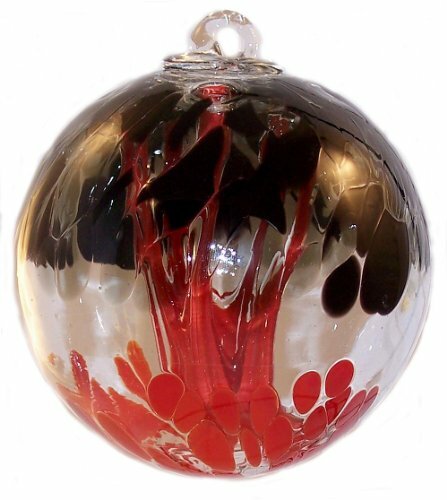 Iron Elegance provides to you the World's Largest Selection Witch Balls, Friendship Balls, (Kugels) and other handcrafted art glass designs. Iron Elegance's Hand Blown Glass- Each One Handcrafted, Unique and produced with Earth friendly recycled glass and production processes. Finest German glass overlay colors. Can be used indoors or outdoors. Dimensions - 6 Inches Diameter. Please note that the item is handmade, by individual artisans; each of them leaving their own individuality within each piece. Differences in color coverage, saturation, glass construction and bubbles are attributes of genuine, handmade product. The Spirit Tree is an artistic representation of the beauty that nature provides us. You can never have too many! Collect them all! DAK 4 Count Shiny Purple Diamond Shatterproof Christmas Ball Ornaments, 3.75"